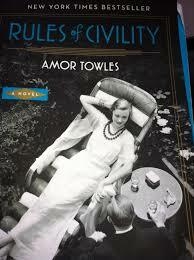 Set in 1930s Manhattan, Rules of Civility by Amor Towles follows the lives and longings of the city’s idle rich and two determined, thirty-ish working class wannabes, Kate and Eve. Along with happenstance and sheer ballsiness, Kate and Eve also use wit, intelligence and good looks to eventually claw their way into the upper echelons of society. The characters are far from stereotypical social climbers; Eve in particular is complex, mysterious and unpredictable. Kate, the central character, is tough and unflappable, taking both success and setback in stride, but often operating without a moral compass. She makes no apologies for her humble upbringing, which might be one of the few likable things about her, but she also makes no effort to stay in touch with her family or her past. At one point Kate meets an old high school classmate on the street who is down on his luck. It would cost her nothing to be kind or at least courteous, yet she is condescending and dismissive and pretends not to know him when they’re both fully aware that she knows who he is. In another instance, on the subway, Kate has no skin in the game, but she cynically contemplates an act of sabotage that borders on cruelty toward a woman she works with. At the last moment Kate decides not to go through with her sin of omission, but not because of her conscience; it is simply a whim. Intentional or not, the book reads like a metaphor for many unappealing characteristics that we see in Americans today. I mean the ones who care only about themselves; they lack compassion, or have contempt for less fortunate, less educated, less lucky fellow Americans. The book is crisply written and steadily entertaining, though at times the writing seems formulaic. It’s a linear story with chapters or sections often starting in a familiar pattern: “At 3:45 on Friday the twenty-fourth…” or “On Sunday afternoon.” It felt a little like marching in lockstep with Kate as she cut a swath through high society while crossing items off her to-do list. I don’t want to give too much way, but I wish I could say that in the end, all these frivolous people got what they deserved, but it’s never that simple.